Bohlen and John Robinson Pierce. La Scena Musicale: You started building clarinets in 1990. Stephen Fox: Yes. The first "normal" modern B♭ clarinet and the first historical replica. They were exhibited at the International Clarinet Association annual convention, which was in Quebec City that year. L.S.M. : As for the Bohlen-Pierce system, you first came across it a little over a decade ago. How did that come about? contacted the college where I was teaching, the Musikk Instrument Akademiet (MIA). He suggested that our school might want to cooperate with his in designing and building BP clarinets, that was in early 2004. I started working on the project with my woodwind making class that year, then continued it back here in Canada after MIA closed down. L.S.M. 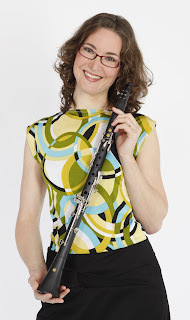 : Currently, there is a German musician by the name of Nora-Louise Müller who we could say is championing the cause for these clarinets in the Bohlen-Pierce system that you now make. I gather it was through that composer that you made the contact with Nora, who studied with him. S.F. : Yes. While studying with Dr. Hajdu she was using one of the BP soprano clarinets that I had built for the Musikhochschule, but I only met her in person at a Bohlen-Pierce symposium in Boston in 2010. L.S.M. : And it was it shortly after meeting up with Dr. Hajdu that that you got into building the prototype, the soprano model. S.F. : I started in 2004 and completed it the following year, though I have kept up refining it ever since..
Oehler, which is more the norm in Germanic countries? L.S.M. : Because it takes two tones of the BP system to cover roughly a minor third, instead of three for the tempered system, it makes me wonder about the number of tone holes on a BP clarinet. Are there less then? S.F. : You are quite right, there are fewer holes. There are only 12 holes to cover a 12th, versus 18 for the conventional chromatic scale. L.S.M. : Because of the less elaborate keywork on a BP clarinet, does it make it "easier" to build one in that system as compared to a standard tempered model? S.F. : The BP clarinet is much easier; it only has 10 keys versus 21 for the standard Boehm system clarinet. Now, it's difficult to count the number of hours that go into each instrument, but I'd guess the BP clarinet takes somewhat less than half as long to build. L.S.M. : Is it the same length as a standard clarinet? S.F. : Yes, and it is so for simplicity’s sake. I chose A440 as the reference pitch (the one pitch which is the same in BP tuning and conventional music), so the BP soprano clarinet is the same length as a standard B♭ clarinet. L.S.M. : In a previous conversation, I believe you said you have built a dozen of them since. Are they all now in the marketplace, being used by professionals.? S.F. : I’ve sold them all, except the very first soprano clarinet, the prototype, which I use for performance. L.S.M. : More recently, you have developed another model, which is called the tenor clarinet, a first for the clarinet family in any case. What then is the story behind the building of this model? Does it compare in range to the alto? S.F. : Dr. Hajdu had originally suggested a whole family of clarinet-type BP instruments. The first tenor was ordered and paid for by the Musikhochschule, and I performed on it at the Boston symposium (though Nora is using it now). It is approximately midway in length between the conventional alto and bass clarinets, hence the term tenor. l..S.M. : More recently, you have branched out in your instrument making and have added a kind of metallophone also tuned in that system. Was it your own decision to investigate this or were you asked by someone?